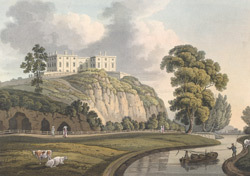 Perched on a cliff top, Nottingham Castle occupied the highest point in the city. The medieval building was demolished in the late 17th century, having being purchased in 1663 by William Cavendish, the first Duke of Newcastle. Between 1674 and 79 he built a palatial country house here, adding particularly fine gardens over the next forty years. The house was burned down in riots over the 1831 Reform Bill, and remodelled between 1876 and 78 as a a municipal museum of art.